If I were told that what I shall write will be read in twenty years by the children of today and that they will weep and smile over it and will fall in love with life, I would devote all my life and all my strengths to it. Tolstoy's teachings influenced Mahatma Gandhi in India. His collected works, which were published in the Soviet Union in 1928-58, consists of 90 volumes. He was such a voracious writer! Tolstoy was not just a writer but also a saintly person who worked for peace and universal brotherhood. His pen always sympathized with the poor and the neglected among people. He taught us that one should try to live a pure and saintly life and love even his enemies. Russian author and one of the greatest of all novelists, Leo Nikolaevich Tolstoy was born on August 28,1828 at Yasnaya Polyana (Russia). He was the fourth of five children. His parents died when he was a child. Soon after the passing away of his parents, his grandmother, who loved him so much, also passed away. Due to these deaths of his most beloved members in the family, Tolstoy became a different child and developed serious ideas about life, death and happiness. He was a quiet and self-conscious boy and had very few friends. In 1844 Tolstoy started his studies of law and oriental languages at Kazan University, but he never took a degree. Tolstoy's years at the University were difficult. He did not even like the type of education being given at the universities. He believed that knowledge without service to mankind is a useless thing. So he left his studies in between and returned to Yasnaya Polyana. In the 1850s Tolstoy began his literary career, publishing his autobiography in three parts: “Childhood” (1852), “Boyhood” (1854), and ”Youth” (1857). Tolstoy's major works include “War and Peace” (1863-69) and “Anna Karenina” (1875-77). Tolstoy once said, "The one thing necessary in life as in art is to tell the truth." Tolstoy's life had two aspects reflecting side by side: one as an author of great novels, and the other, as a great saint devoted to personal and social transformation of the humankind. In 1857 he visited France, Switzerland, and Germany to learn more about social reforms. After his travels Tolstoy settled back in Yasnaya Polyana, where he started a school for poor children of the farmers. He saw that the secret of changing the world lay in education. In 1862 he married Sonya Andreyevna Behrs who also acted as his devoted secretary. 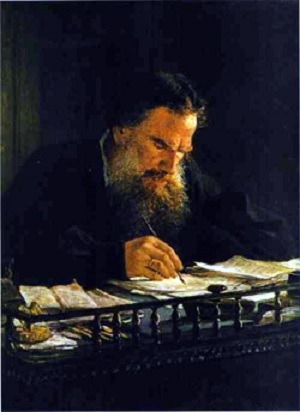 Tolstoy was a voracious reader and he liked Literature and Philosophy. He had a deep knowledge of the thoughts and philosophies of Plato, Rousseau, Dickens, Goethe, Thackeray and Eliot. Tolstoy was a powerful personality of his time and an immortal writer who inspired many souls. He wrote in a very simple style but if you will read his stories, they will touch your very core of heart. Rabindranath Tagore, the first Nobel Laureate of India, reflects Tolstoy’s image greatly imbibed in his work and personality. Tolstoy's major work, “War and Peace”, appeared between the years 1865 and 1869. The epic tale depicted the story of five families against the background of Napoleon's invasion of Russia. War and Peace reflected Tolstoy's view that all is predestined, but we cannot live unless we imagine that we have free will. Tolstoy's other masterpiece, “Anna Karenina”, tells us the tragic story of a married woman who follows her lover but finally at a station throws herself in front of a train. In the 1880s Tolstoy wrote such philosophical works as “A Confession” and “What I Believe”, which was banned in 1884. “Voskresenia” (1899) was Tolstoy's last major novel. Portrait of Leo Tolstoy. 1884. by Nikolay Gay. Oil on canvas.